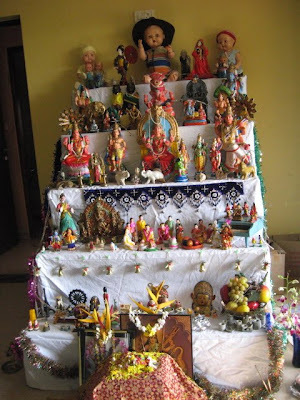 The last two days of navaratri have been as hectic as the first……. I have tried to visit all my relatives, and return in time to be home to receive those who come to my house, and it has been a race against time, with my wishing for a few more hours each day. However, I have some interesting kolus for you today. The Dashavataram set is beautiful, with great detailing, but the Vamanavatar one is missing…..
Samhith was fascinated by the fruits and vegetables, especially the tiny ones…. 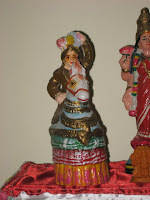 Now here’s a Kolu of one of our neighbours – they are an old couple who still take the pains to make a side decoration. This is one house I take Samhith to, every year, no matter what! 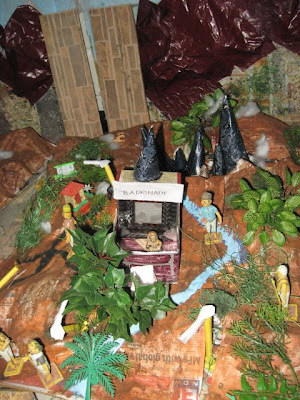 This year, they have made Kedarnath and Badrinath. One of their grandsons has brought all those plastic trees and plants from the US, and Samhith wants some!!! He now has wonderful ideas for a hill scene next year, and says we can make it even better!!! 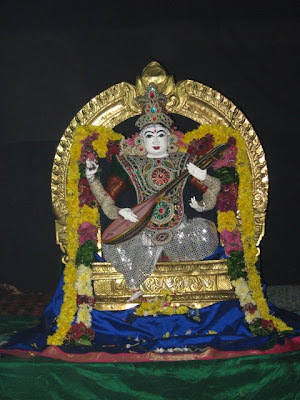 At the temple, the theme, being Ashtami, was Mahishasura Mardhini……. While we loved the decoration, Samhith was curious to know why the Devi wasn’t shown killing Mahishasura. He said they looked very friendly together, something which brought smiles to the faces of all those around, including the vadhyar who had made the decoration!!!! 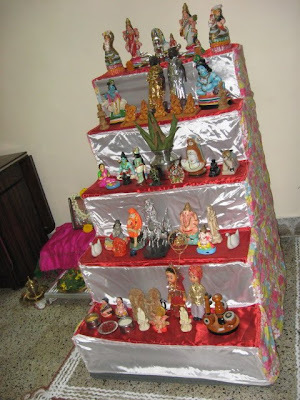 Navami began with me performing the Saraswati Puja at home. Here is my arrangement, the photograph of Saraswati kept on top of books (which are covered by the cloth). We then hurried to visit some more relatives, our last such trip for the year…. 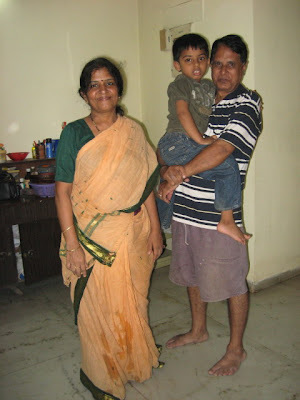 The first house we visited was Shankar’s uncle and aunt’s at Vashi. 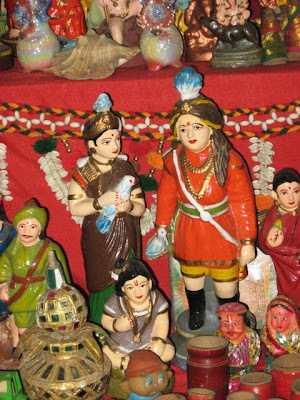 While they had kept a small Kolu this year, the highlight was a beautiful set of dolls depicting the Brahmotsavam at Tirupati.. ……. Here is Samhith with them…. 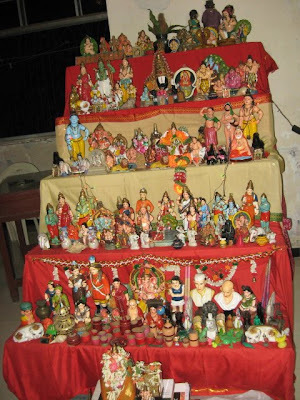 The next stop was another uncle’s place, this time at Chembur, and here is their kolu….. I especially love this set of dolls…. Our final visit was to another of our relatives’ place at Chembur, who keep a beautiful Kolu with some beautiful dolls…..
And finally, at the temple, the decoration was Saraswati….. The nine days and nights of the festival are through, and so are we with our socializing. Tomorrow all the toys will be taken out and returned to their trunk, where they will hide till next year (hopefully) to emerge for another round of celebration. 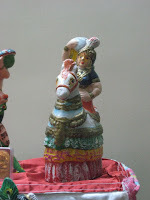 The 10th day is still here, though, to be celebrated, and I shall be back with my last post on this festival…..